Ehud Olmert (Hebrew: אֶהוּד אוֹלְמֶרְט‎, IPA: [eˈhud ˈolmeʁt] ( listen); born 30 September 1945) is an Israeli politician and lawyer. He served as the 12th Prime Minister of Israel from 2006 to 2009 and before that as a cabinet minister from 1988 to 1992 and from 2003 to 2006. Between his first and second stints as a cabinet member, he served as mayor of Jerusalem from 1993 to 2003. After serving as PM he was sentenced to serve a prison term over convictions for accepting bribes and for obstruction of justice during his terms as mayor of Jerusalem and as trade minister. Olmert was born near Binyamina in the British Mandate of Palestine. According to Olmert, his parents, Bella (Wagman) and Mordechai Olmert, escaped "persecution in Ukraine and Russia, and found sanctuary in Harbin, China. They emigrated to Israel to fulfill their dream of building a Jewish and democratic state living in peace in the land of our ancestors." His father later became a member of the Knesset for Herut. Olmert's childhood included membership in the Beitar Youth Organization and dealing with the fact that his parents were often blacklisted and alienated due to their affiliation with the Jewish militia group the Irgun. They were also part of Herut, the opposition to the long-ruling Mapai party. However, by the 1970s, this was proving less detrimental to one's career than during the 1950s. Olmert graduated from the Hebrew University of Jerusalem with degrees in psychology, philosophy and law. He opened a successful law partnership in Jerusalem. Olmert served with the Israel Defense Forces in the Golani Brigade. While in service he was injured and temporarily released. He underwent many treatments, and later completed his military duties as a journalist for the IDF magazine BaMahane. During the Yom Kippur War, he joined the headquarters of Ariel Sharon as a military correspondent. Already a member of the Knesset, he decided to go through an officer's course in 1980 at the age of 35. In 1966, during the Gahal party convention (a predecessor to today's Likud), party leader Menachem Begin was challenged by the young Olmert, who called for his resignation. Begin announced that he would retire from party leadership, but soon reversed his decision when the crowd emotionally pleaded with him to stay. Olmert was first elected to the Knesset in 1973 at the age of 28, and was re-elected seven consecutive times. Between 1981 and 1989, he served as a member of the Foreign Affairs and Defense Committee and served on the Finance, Education and Defense Budget Committees. He served as minister without portfolio, responsible for minority affairs between 1988 and 1990, and as minister of health from 1990 until 1992. Following Likud's defeat in the 1992 election, instead of remaining a Knesset member in the opposition, he successfully ran for mayor of Jerusalem in November 1993. Between 1993 and 2003, Olmert served two terms as mayor of Jerusalem, the first member of Likud or its precursors to hold the position. During his term in office, he devoted himself to the initiation and advancement of major projects in the city, the development and improvement of the education system, and the development of road infrastructure. He also spearheaded the development of the light rail system in Jerusalem, and the investment of millions of shekels in the development of mass transportation options for the city. While mayor of Jerusalem, Olmert was an invited speaker at an international conflict resolution conference held in Derry, Northern Ireland. In his address, he spoke of how "Political leaders can help change the psychological climate which affects the quality of relationships among people." His speech concluded with reflections on the importance of political process in overcoming differences: "How are fears born? They are born because of differences in tradition and history; they are born because of differences in emotional, political and national circumstances. Because of such differences, people fear they cannot live together. If we are to overcome such fear, a credible and healthy political process must be carefully and painfully developed. A political process that does not aim to change the other or to overcome differences, but that allows each side to live peacefully in spite of their differences." 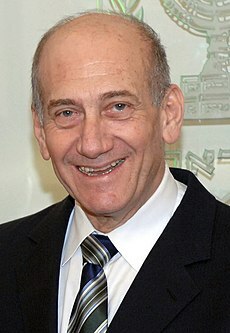 Olmert was elected as a member of the sixteenth Knesset in January 2003. He served as the head of the election campaign for Likud in the elections, and subsequently was the chief negotiator of the coalition agreement. Following the elections he was appointed as Designated Acting Prime Minister and Minister of Industry, Trade and Labor. From 2003 to 2004, he also served as Minister of Communications. I voted against Menachem Begin, I told him it was a historic mistake, how dangerous it would be, and so on and so on. Now I am sorry he is not alive for me to be able to publicly recognize his wisdom and my mistake. He was right and I was wrong. Thank God we pulled out of the Sinai. When Sharon announced he was leaving Likud to form a new party, Kadima, Olmert was one of the first to join him. On 4 January 2006, as the designated Acting Prime Minister, Olmert became Acting Prime Minister as a result of the serious stroke suffered by then Prime Minister Ariel Sharon. This occurred after consultations took place between Cabinet Secretary Yisrael Maimon and Attorney General Menachem Mazuz, who declared Sharon "temporarily incapable to carry out the duties of his office", while only officially in office. Then, Olmert and the cabinet reaffirmed in an announcement that the 28 March elections would be held as scheduled. During the days following the stroke, Olmert met with Shimon Peres and other Sharon supporters to try to convince them to stay with Kadima, rather than return to Likud or, in Peres' case, Labor. On 16 January 2006, Olmert was elected chairman of Kadima, and Kadima's candidate for prime minister in the upcoming election. In his first major policy address on 24 January 2006 after becoming caretaker Prime Minister, Olmert stated that he backed the creation of a Palestinian state, and that Israel would have to relinquish parts of the West Bank to maintain its Jewish majority. At the same time, he said, "We firmly stand by the historic right of the people of Israel to the entire Land of Israel." In a number of interviews, he also introduced his Realignment plan, which would see Israel unilaterally withdraw from most of the West Bank and redraw its borders to incorporate major settlement blocs into Israel. The plan was shelved following the 2006 Lebanon War. Following the March 2006 election, Kadima won 29 seats, making it the largest party. On 6 April, Olmert was officially asked by President Moshe Katsav to form a government. Olmert had an initial period of 28 days to form a governing coalition, with a possible two-week extension. On 11 April, the Israeli Cabinet deemed that Sharon was incapacitated. The 100-day replacement deadline was extended due to the Jewish festival of Passover, and a provision was made that, should Sharon's condition improve between 11 and 14 April, the declaration would not take effect. Therefore, the official declaration took effect on 14 April, formally ending Sharon's term as prime minister and making Olmert the country's new Interim Prime Minister in office (he would not become the official prime minister until he formed a government). On 4 May 2006, Olmert presented his new government to the Knesset. Olmert became prime minister and minister for welfare. Control over the Welfare Ministry was expected to be given to United Torah Judaism if it would join the government. The post was later given to Labor's Isaac Herzog. Olmert took over as acting prime minister of Israel after Ariel Sharon suffered a stroke. On 24 May 2006, Olmert was invited to address a joint session of the U.S. Congress. He stated that his government would proceed with the disengagement plan if it could not come to agreement with the Palestinians. Olmert was the third Israeli prime minister to have been invited to speak at a joint session of Congress. Following the 2006 Lebanon War, Olmert's popularity ratings fell and, on 15 September 2006, former chief of staff Moshe Ya'alon publicly stated that Olmert should resign. In May 2007, Olmert's approval rating fell to 3%, and he became the subject of a Google Bomb for the Hebrew for "miserable failure". 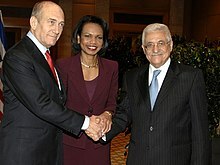 Ehud Olmert meets with Condoleezza Rice and Mahmoud Abbas. On 9 December 2006, Olmert stated that he could not rule out the possibility of a military attack against Iran, and called for the international community to step up action against that country. He called Iranian President Mahmoud Ahmadinejad's repeated threats to destroy Israel "absolutely criminal", and said that he expected "more dramatic steps to be taken". In an interview with German TV network Sat.1 on 11 December 2006, Olmert included Israel in a list of nuclear powers, saying: "Iran, openly, explicitly and publicly, threatens to wipe Israel off the map. Can you say that this is the same level, when they are aspiring to have nuclear weapons, as America, France, Israel and Russia?" He immediately attempted to backtrack, insisting that Israel's doggedly held position of nuclear weapons ambiguity had not changed. He nonetheless came under harsh criticism from both ends of the Israeli political spectrum due to the perceived threat to Israel's policy of ambiguity regarding its nuclear status. On 2 May 2007, the Winograd Commission accused Olmert of failing to properly manage the 2006 Lebanese War, which prompted a mass rally of over 100,000 people calling for his resignation. Olmert welcomed the Arab League's 2007 re-endorsement of the Arab Peace Initiative. Olmert wrote in The Guardian newspaper that Israel was ready to make "painful concessions" to achieve peace with the Palestinians. "I take the offer of full normalization of relations between Israel and the Arab world seriously; and I am ready to discuss the Arab peace initiative in an open and sincere manner. Working with our Jordanian and Egyptian partners, and hopefully other Arab states, we must pursue a comprehensive peace with energy and vision.... But the talks must be a discussion, not an ultimatum." On 4 November 2007, he declared Israel's intention to negotiate with the Palestinians about all issues, stating, "Annapolis will be the jumping-off point for continued serious and in-depth negotiations, which will not avoid any issue or ignore any division that has clouded our relations with the Palestinian people for many years." On 29 November 2007, he warned of the end of Israel in case a two-state solution is not eventually found for the Israeli-Palestinian dispute. "If the day comes when the two-state solution collapses, and we face a South African-style struggle for equal voting rights (also for the Palestinians in the territories), then, as soon as that happens, the State of Israel is finished", Olmert said on the last day of the Annapolis Conference. "The Jewish organizations, which were our power base in America, will be the first to come out against us", Olmert said, "because they will say they cannot support a state that does not support democracy and equal voting rights for all its residents". During the talks, Olmert agreed that Israel would share Jerusalem as the joint capital of Israel and a Palestinian state and hand over its holy sites to a multinational committee, land swaps that would allow Israel to keep its major settlement blocs in the West Bank, the construction of a tunnel connecting the West Bank and the Gaza Strip, and a demilitarized Palestinian state with an American-led international security force stationed on the Palestinian–Jordanian border. Both sides disagreed over how much land would be exchanged in the swaps, with Olmert demanding at least 6.3-6.8% of the West Bank and Abbas insisting a swap would not exceed 1.9%. In his memoirs, Olmert wrote that he agreed Israel would generously compensate the remaining refugees. Olmert later stated that U.S. President George W. Bush offered to accept another 100,000 refugees as American citizens if a peace agreement was signed. U.S. Secretary of State Condoleezza Rice wrote in her memoirs that the Palestinians demanded they be allowed to negotiate additional "returns" to Israel following the peace deal, insisting that the right of return was a matter of individual choice that would ultimately have to apply to every refugee. In his memoirs, Olmert claimed that he and Abbas were very close to an agreement, but Abbas' hesitation, Olmert's legal troubles, and the Gaza War caused the talks to end. President Bush wrote in his memoirs that the talks broke down when Olmert announced that he would resign from office, and Abbas then broke off the talks and refused to finalize an agreement on the grounds that he did not want to sign a peace deal with a Prime Minister on his way out of office. During at least two meetings, Olmert made a secret promise to Abbas: Once a prisoner exchange deal for captive Israeli soldier Gilad Shalit was finalized with Hamas, Israel would bolster Abbas' government by releasing Fatah prisoners. After a prisoner exchange deal was agreed upon in 2011 under Prime Minister Benjamin Netanyahu, Olmert's successor, Palestinian officials demanded that Netanyahu live up to Olmert's promise and release Fatah prisoners. On 6 September 2007, Israel launched Operation Orchard, an airstrike against a suspected nuclear reactor in Syria, allegedly being built with North Korean and Iranian assistance. The strike was preceded by years of covert operations by Israeli special forces and the Mossad. Details of the strike were censored in Israel, and the attack was not confirmed to have taken place until 2 October. Following the attack, Olmert's approval rating rose to 35%. President Bush wrote in his memoirs that Olmert had first asked him to bomb the facility, but ordered the attack after Bush refused and told him that he would prefer diplomatic action and sanctions. Following the strike, Bush claimed to have suggested to Olmert to hide the strike for a while and then make it public as a way to isolate the Syrian government, but Olmert asked for total secrecy, wanting to avoid anything that could force Syria to retaliate. However, Israeli columnist Caroline Glick wrote that Israel had bowed to US demands in concealing the airstrike. In May 2008, Israel opened Turkish-brokered indirect peace talks with Syria. Olmert stated that the resumption of peace talks with Syria was a national obligation that must be tried. However, Syria broke off the talks several months later in response to the Gaza War. Rocket and mortar attacks by Palestinian terrorists from the Hamas-controlled Gaza Strip on Israel occurred frequently throughout the spring and summer of 2008, until a ceasefire was agreed between Hamas and Israel in June. Rocket attacks increased sharply in November after an Israeli raid on an Hamas-built smuggling tunnel. The ceasefire expired in December 2008 and negotiations stalled between the two parties to renew the ceasefire. On 24 December, the Negev was hit by more than 60 mortar shells and Katyusha and Qassam rockets, and the IDF was given a green light to operate. Hamas claimed to have fired a total of 87 rockets and mortar rounds that day at Israel, code-naming the firing "Operation Oil Stain". On 25 December 2008, Olmert delivered a "last minute" warning to Gaza in direct appeal to Gaza's people via the Arabic language satellite channel al-Arabiya, to pressure their leaders to stop the rocket barrages. "I am telling them now, it may be the last minute, I'm telling them stop it. We are stronger", he said. The attacks did not stop and Israel launched its military operation, codenamed Operation Cast Lead, on the morning of 27 December, when more than 50 fighter jets and attack helicopters began to bomb strategic targets. Air and naval strikes continued for days, when on 3 January 2009 the IDF began a ground invasion of the Gaza Strip. The fighting lasted 22 days until a ceasefire came into effect. Israel subsequently withdrew from Gaza. The UN Security Council passed a resolution on 8 January 2009 calling for an immediate ceasefire to the hostilities in the Gaza Strip. It passed 14–0–1, with one abstention from the United States. Olmert told reporters, "[U.S. Secretary of State Condoleezza Rice] was left shamed. A resolution that she prepared and arranged, and in the end she did not vote in favor. In the night between Thursday and Friday, when the Secretary of State wanted to lead the vote on a ceasefire at the Security Council, we did not want her to vote in favor. I said 'get me President Bush on the phone'. They said he was in the middle of giving a speech in Philadelphia. I said I didn't care. 'I need to talk to him now'. He got off the podium and spoke to me. I told him the United States could not vote in favor. It cannot vote in favor of such a resolution. He immediately called the Secretary of State and told her not to vote in favor." When asked about the comments, a White House spokesman said that Olmert's version of events was "inaccurate". The war finally ended on 18 January 2009. A day before, Israeli officials announced a unilateral ceasefire, without an agreement with Hamas. In a press conference, Israeli Prime Minister Olmert declared the ceasefire effective that night, at 00:00 GMT on 18 January. On 30 July 2008, Olmert announced that he would not contest the Kadima party leadership election in September and would resign from office once his party elects a new leader. In his resignation speech, he addressed the cases of corruption of which he is being accused, saying he is "proud to be a citizen of a country in which a Prime Minister can be investigated like any other citizen", but also stated he "was forced to defend [himself] from ceaseless attacks by the self-appointed soldiers of justice, who sought to oust [him] from [his] position". The move has been interpreted as signaling the end of Olmert's political career. Many politicians across the political spectrum praised Olmert's decision to resign. Foreign Minister Tzipi Livni said "the personal decision was not simple, but it was a correct one. Kadima must continue to act in a way that will preserve its unity and ability to lead." Defense minister and Labor party leader Ehud Barak called Olmert's announcement "a proper and responsible decision made at the right time". Opposition leaders called for the resignation to be followed by general elections. The Likud party leader, Benjamin Netanyahu, called for snap elections: "It doesn't matter who heads Kadima. They are all partners in this government's total failure. National responsibility requires a return to the people and new elections." After Tzipi Livni won the leadership election, Olmert officially resigned but remained prime minister, according to the dictates of the law. Even after an official resignation, he remained in power until a new prime minister was sworn in, in order to prevent a government void. Livni tried unsuccessfully to form a new coalition government. After Livni announced she could not form the new government, new parliamentary elections were set for 10 February 2009, and Olmert remained in power until after the elections, just as the law dictates. Beginning in the mid-1980s, Olmert was subjected to a string of corruption allegations that resulted in multiple police investigations. According to Israeli journalist Yossi Melman, the repeated investigations led some to believe that Olmert was corrupt but a master at covering his tracks, while others believed that the authorities were simply obsessed with harassing him. On 7 March 2006, it was disclosed that an inquiry was being carried out on the 1999 sale and lease-back of a Jerusalem property purchased by Olmert in 2004, which allegedly was done on financial terms very favorable to Olmert, in what would amount to an illegal campaign contribution and/or bribe. Olmert was alleged to have paid $325,000 below market value. A criminal investigation regarding the matter was formally launched on 24 September 2007. The investigation closed in August 2009 due to lack of evidence. On 16 January 2007, a criminal investigation was initiated against Olmert. The investigation focused on suspicions that during his tenure as finance minister, Olmert tried to steer the tender for the sale of Bank Leumi in order to help Slovak-born Australian real estate baron Frank Lowy, a close personal associate. Israeli Finance Ministry Accountant General Dr. Yaron Zelekha was as a key witness, according to the State Comptroller's office. The state comptroller testified against Olmert. Israeli Police who investigated the case eventually concluded that the evidence that was collected was insufficient for indictment, and no recommendations were made to press charges. In October 2007, he was questioned for five hours by three officers from the National Fraud Investigations Unit in his Jerusalem residence. State Prosecutor Moshe Lador closed the case in December 2008 due to lack of evidence. In April 2007, it was further alleged that, during his office as Minister of Trade, Industry and Labor, Olmert may have been guilty of criminal behavior by taking an active part in an investment center. Prosecutors said that Olmert placed himself in a conflict of interest by personally dealing with issues involving business figures represented by his friend and former business partner, lawyer Uri Messer. Olmert was alleged to have changed some decisions made by his ministry in their favor. During a parliamentary inquest in July 2007, Olmert flatly denied these accusations. In October 2007, Attorney General Mazuz ordered a police investigation into allegations that Olmert, when he held the positions of trade minister, communications minister and finance minister, had improperly appointed associates from the Likud party to posts on government bodies. Police completed their investigation in 2009, and concluded that there was a basis to indict Olmert and others for fraud and breach of trust. In July 2008, Haaretz reported that in 1992, Olmert took a loan from U.S. businessman Joe Almaliah, but never repaid it, and concealed the true size of the loan from the State Comptroller. In March 2003, State Comptroller Eliezer Goldberg asked Olmert to submit the wealth-declaration statement required of all cabinet ministers. Olmert disclosed that he had taken a loan from Almaliah, but did not say when it was due. In 2004, Olmert conceded that he had taken $75,000, and stressed that Almaliah had not asked for repayment of the loan. At Goldberg's insistence, Olmert signed a contract with Almaliah undertaking to repay the loan in January 2009. According to an indictment, Olmert had actually taken another $100,000 from Almaliah, which was deposited into his personal bank account. The State Prosecutor's office said that it was not aware of Olmert's repayment of either loan. In May 2008, it became public that Olmert was the subject of another police investigation, concerning allegations of bribery. Olmert said that he took campaign contributions from Jewish-American businessman Morris Talansky when he was running for mayor of Jerusalem, leadership of the Likud and candidacy in the Likud list for the Knesset. It was alleged that Olmert unlawfully received millions of shekels in illegal campaign funding from Talansky over a 15-year period. Olmert resisted calls to resign, and stated: "I never took bribes, I never took a penny for myself. I was elected by you, citizens of Israel, to be the Prime Minister and I don't intend to shirk this responsibility. If Attorney General Meni Mazuz, decides to file an indictment, I will resign from my position, even though the law does not oblige me to do so." On 2 May, head of the National Fraud Investigations Unit Brigadier-General Shlomi Ayalon and two investigators questioned Olmert for 90 minutes in his Jerusalem residence. On 23 May, National Fraud Investigations Unit officers interrogated Olmert for an hour in his Jerusalem residence. On 27 May, Talansky testified in court that over the last 15 years he gave Olmert more than $150,000 in cash in envelopes to fund political campaigns, and hinted that Olmert also used the money for fine hotels, cigars, pens and watches. On 6 September 2008, the Israel Police recommended that criminal charges should be brought against Olmert. In their indictment, prosecutors claimed that Olmert had received some $600,000 from Talansky in either cash or bank transfers, and that $350,000 of this was held in a "secret cache" managed by Olmert's close associate Uri Messer. The prosecution also claimed that Olmert used his official capacity as minister of trade and industry to facilitate introductions with hotel managers for Talansky, a partner in a firm providing mini-bars for hotels. It was alleged that Olmert sometimes used official letterheads. The charge sheet said that Olmert was aware he was in an "acute conflict of interest". On 26 November 2008, Attorney General Menachem Mazuz informed Olmert that he decided to file an indictment against him in what has come to be known as "Rishon Tours" affair, pending a hearing before Mazuz. The scheme allegedly worked as follows: Olmert would speak abroad on behalf of groups such as the Yad Vashem Holocaust memorial, a support group for the Israel Defense Forces or a charity for mentally disabled Israeli children. Rishon Tours then billed each group for the same trip as if they alone were paying, and placed the money in a special bank account allegedly for Olmert's personal use. Prosecutors charged that Olmert had gained $92,164. On 1 March 2009, Attorney General Mazuz informed Olmert's legal representatives that he had decided to file an indictment against him, in what has come to be known as the "cash envelopes" affair, pending a hearing before the attorney general. In 2010, it was cleared for publication that the National Fraud Investigations Unit suspected Olmert of involvement in the "Holyland Affair", where officials took bribes in exchange for promoting real estate projects, especially the Holyland real estate development project in southwest Jerusalem, which was allowed to grow 1,200% beyond the limit authorized. As Mayor of Jerusalem, Olmert allegedly took thousands of shekels in bribe money from businessmen, entrepreneurs, and stakeholders. On 30 August 2009, an indictment against Olmert was served at the Jerusalem District Court. The indictment includes the following counts: obtaining by fraud under aggravating circumstances, fraud, breach of trust, falsifying corporate documents, and tax evasion. The indictment refers to three out of the four corruption-related cases standing against him: "Rishon Tours", "Talansky" (also known as the "money envelopes" affair), and the "Investment Center". This was the first indictment of someone who has ever held the office of Israeli Prime Minister. On 25 September 2009, Olmert's trial opened. The court began hearing testimonies on 22 February 2010, with three discussions per week. The prosecution began arguing its case at the beginning of the trial, and the prosecution phase ended on 30 March 2011. The defense phase began on 31 May, and they began with Olmert testifying in his own defense. On 30 June, the prosecution began a cross-examination on the various charges. In January 2012, Olmert was indicted for taking bribes over the Holyland affair. The indictment was filed in the Tel Aviv District Court. After Olmert began accusing his secretary, Shula Zaken, of committing the crimes he was charged with, Zaken began negotiating a plea bargain with prosecutors. In late March 2014, prosecutors signed a plea bargain with Zaken, under which she would plead guilty, and prosecutors would not request a prison term longer than 11 months. As part of the plea bargain, Zaken agreed to provide evidence and testify against Olmert as a state's witness. On 10 July 2012, Olmert was convicted on one count of breach of trust over the investment center case, but exonerated over the Talansky and Rishon Tours affairs. In September 2012, he was given a one-year suspended sentence and a fine of ₪75,000 ($21,000). On 31 March 2014, five years to the day after he was replaced by Benjamin Netanyahu as Prime Minister, Olmert was convicted of two counts of bribery over the Holyland affair by Tel Aviv District Court Judge David Rosen, who ruled that he had accepted ₪560,000 ($160,000) while serving as mayor of Jerusalem, and had lied about it in court. He was acquitted on two other corruption charges. Olmert and eight other defendants, including former Jerusalem mayor Uri Lupolianski and former Bank Hapoalim chairman Dan Dankner, were convicted of accepting bribes in exchange for helping land developers receive municipality licenses for the Holyland Park residential project in the city. Olmert's sentencing hearing began on 28 April 2014. On 13 May 2014, he was sentenced to 6 years in prison and fined ₪1.5 million ($430,000). He was ordered to report to prison on 1 September to begin serving his sentence. In addition to the Holyland affair, Zaken provided new evidence against Olmert in the Talansky and Rishon tours affairs. Olmert and his lawyers were subsequently questioned by police on suspicion of obstruction of justice and witness tampering. Following an investigation, police announced that there was sufficient evidence to indict Olmert for obstruction of justice. On 7 August 2014, following Zaken's testimony, the Israeli Supreme Court ordered a retrial of Olmert in the Talansky case. In September 2014, the Supreme Court ruled that Olmert could stay out of prison pending an appeal. Oral arguments would have to take place within three months, but together with the delay in the final verdict he could potentially stay out of prison for over a year. As of March 2015, Olmert was yet to serve his sentence. He began serving a 19-months sentence on 15 February 2016 in Maasiyahu Prison. In December 2014, Zaken again provided new evidence, revealing that Olmert had offered her $10,000 for every month she would serve in jail for taking the blame in the Holyland case, to be paid in a foreign bank account. In one of the eight recordings revealed, Olmert can also be heard talking about buying Sheldon Adelson's, a Jewish-American billionaire's, testimony, and how he told U.S. President George W. Bush about Olmert's traitorship: "Adelson – this dog, son of a dog – went to President Bush and said that I’m a traitor. Bush told me." In March 2015, Olmert was convicted in Jerusalem District Court of fraud, breach of trust, and tax evasion in his retrial on corruption charges over the Talansky case. The judges ruled that he had taken bribes and used the funds for personal reasons without reporting it. Sentencing was set for May, and his lawyers advised he would appeal. Olmert was sentenced to eight months in prison in connection with the Talansky case on 25 May 2015, as well as fined ₪100,000 ($25,000) and given an additional suspended sentence of eight months. The prison sentence was stayed for 45 days to allow Olmert's legal team time to appeal the ruling. The verdict acknowledged Olmert's public service, and he was given a weaker sentence than prosecutors sought. Olmert filed an appeal of his conviction to the Supreme Court of Israel in July 2015; the court agreed that Olmert's sentence would be suspended until after the outcome of the appeal. The conviction meant that Olmert was sentenced over misdeeds from both his time as mayor of Jerusalem, as well as Trade Minister of Israel. Olmert's wife, Aliza, is a writer of novels and theater plays, as well as an artist. Aliza is more left-leaning in her politics than her husband. She claimed to have voted for him for the first time in 2006. The couple has four biological children and an adopted daughter. The oldest daughter, Michal, holds a master's in psychology and leads workshops in creative thinking. Another daughter Dana is a lecturer in literature at the Tel Aviv University, and the editor of a literature series. She is a lesbian and lives with her partner in Tel Aviv. Her parents are accepting of her sexual orientation and partner. Dana is active in the Jerusalem branch of the Israeli human rights organization Machsom Watch. In June 2006 she attended a march in Tel Aviv protesting alleged Israeli complicity in the Gaza beach blast, which made her the subject of bitter criticism from right-wing personalities. Olmert's father Mordechai, a pioneer of Israel's land settlement and a former member of the Second and Third Knessets, grew up in the Chinese city of Harbin, where he led the local Betar youth movement. Olmert's grandfather J. J. Olmert settled in Harbin after fleeing post-World War I Russia. In 2004, Olmert visited China and paid his respects at the tomb of his grandfather in Harbin. Olmert said that his father had never forgotten his Chinese hometown after moving to what was then the British Mandate of Palestine, in 1933 at the age of 22. "When he died at the age of 88, he spoke his last words in Mandarin Chinese", he recalled. In October 2007, Olmert announced that he had prostate cancer. His doctors declared it to be a minor risk. In April 2009, Olmert's spokesman issued a statement indicating that Olmert's cancer had deteriorated. In 2009, Olmert spoke at various colleges throughout the United States to mixed receptions. In October 2009, he visited Magnolia, Arkansas, and spoke about Israeli farming, technology and Israel's view on Iran. The speech was given at Southern Arkansas University, where he also invited the rural university to form a partnership with Israel's Hebrew University of Jerusalem. In 2012, he expressed opposition to a military strike on Iran. ^ "Address by Prime Minister Ehud Olmert to Joint meeting of US Congress". Israel Embassy Washington, D.C. 24 May 2006. Archived from the original on 17 August 2007. Retrieved 7 March 2017. ^ "Former Prime Minister Ehud Olmert". Ynetnews. 4 May 2009. Archived from the original on 19 September 2010. Retrieved 18 July 2012. ^ Keenan, Brian (21 July 2006). "After the flood". The Guardian. Archived from the original on 19 September 2010. Retrieved 18 July 2012. ^ "Netanyahu quits over Gaza pullout". BBC News. 7 August 2005. Archived from the original on 10 February 2006. Retrieved 18 July 2012. ^ Wilson, Scott (13 August 2005). "Pullout Focuses Israel on Its Future". The Washington Post. Retrieved 18 July 2012. ^ "Kadima confirms Olmert as leader". BBC News. 16 January 2006. Archived from the original on 19 September 2010. Retrieved 18 July 2012. ^ "Address by Acting PM Ehud Olmert to the 6th Herzliya Conference". Washington, D.C.: Embassy of Israel. 24 January 2006. Archived from the original on 19 September 2010. ^ "Olmert Under Fire". Time. 3 May 2007. Retrieved 18 July 2012. ^ "Israeli Prime Minister Gets Google Bombed And That's Good For Everyone". Rank Above. Archived from the original on 2 February 2007. ^ Harding, Luke; Campbell, Duncan (13 December 2006). "Calls for Olmert to resign after nuclear gaffe". The Guardian. Archived from the original on 27 August 2009. Retrieved 22 September 2012. ^ Myre, Greg (3 December 2006). "In a Slip, Israel's Leader Seems to Confirm Its Nuclear Arsenal". The New York Times. Archived from the original on 20 September 2013. Retrieved 22 September 2012. ^ "PMO denies that Olmert disclosed Israel's nuclear hand". The Jerusalem Post. Archived from the original on 19 September 2010. ^ Singer-Heruti, Roni; Barak Ravid; Nir Hasson (2 May 2007). "3DRoughly 100,000 people rally in Tel Aviv to call on PM, Peretz to quit". Haaretz. Archived from the original on 19 September 2010. Retrieved 18 July 2012. ^ "Olmert says wants talks on Arab peace initiative". Reuters. 6 June 2007. Archived from the original on 19 September 2010. Retrieved 12 January 2009. ^ Cooper, Helene (4 November 2007). "Olmert Backs Mideast Peace Conference". The New York Times. Archived from the original on 13 March 2014. Retrieved 5 November 2007. ^ "Two-state solution, or Israel is done for". Haaretz. 29 November 2007. Archived from the original on 6 May 2009. Retrieved 30 November 2007. ^ Nathan Thrall, 'What Future for Israel?,' New York Review of Books 15 August 2013 pp.64-67. ^ Bronner, Ethan (27 January 2011). "In Memoirs, Olmert Says He and Abbas Were Near Peace Deal". The New York Times. Archived from the original on 19 September 2010. ^ "The Palestine Papers | Al Jazeera Transparency Unit". Transparency.aljazeera.net. Archived from the original on 19 September 2010. Retrieved 14 February 2012. ^ Hasson, Nir (25 January 2011). "Palestinian map of dividing Jerusalem 'out of touch with reality', says cartographer". Haaretz. Archived from the original on 19 September 2010. Retrieved 14 February 2012. ^ Ravid, Barak; Jonathan Lis (19 September 2010). "Olmert: Bush offered to absorb 100,000 Palestinian refugees if peace deal reached". Haaretz. Archived from the original on 19 September 2010. Retrieved 18 July 2012. ^ Stoil, Rebecca Anna (1 November 2011). "Rice reveals concessions in 2008 peace talks". The Jerusalem Post. Archived from the original on 19 September 2010. Retrieved 14 February 2012. ^ "Abbas: Olmert promised more prisoners after Shalit". Ynetnews. 21 October 2011. Archived from the original on 23 October 2011. Retrieved 14 February 2012. ^ Glick, Caroline. "Hardball with Washington: Column One". The Jerusalem Post. ^ Ravid, Barak; Amos Harel; Avi Issacharoff (22 May 2008). "Olmert labels Syria talks 'historic breakthrough'". Haaretz. Archived from the original on 19 September 2010. Retrieved 14 February 2012. ^ Gil Ronen. "Syria, Turkey Break Off Talks with Israel Because of Gaza Op". Arutz Sheva. Archived from the original on 19 September 2010. Retrieved 15 March 2014. ^ Hider, James (6 November 2008). "Six die in Israeli attack over Hamas 'tunnel under border to kidnap soldier'". The Times. London. Retrieved 8 January 2009. ^ "IDF gets green light to strike Hamas after rocket barrage". The Jerusalem Post. 27 December 2008. Archived from the original on 19 September 2010. Retrieved 13 January 2009. ^ "Hamas: 87 shells fired at Israeli targets in 24 hours". Bethlehem, PS: Ma'an News Agency. 25 December 2008. Archived from the original on 19 September 2010. Retrieved 3 January 2009. ^ "Olmert Delivers 'Last Minute' Warning to Gaza". Fox News Channel. 25 December 2008. Archived from the original on 19 September 2010. Retrieved 13 January 2009. ^ "Israel hits Hamas targets in Gaza". BBC News. 1 February 2009. Archived from the original on 19 September 2010. Retrieved 18 July 2012. ^ "Israel vows 'disproportionate' response to Gaza rocket attacks". The Daily Telegraph. 1 February 2009. Archived from the original on 19 September 2010. Retrieved 18 July 2012. ^ "Rice shame-faced by Bush over UN Gaza vote: Olmert". Google News. 12 January 2009. Archived from the original on 14 April 2010. Retrieved 14 March 2014. ^ "W. House: reports of Olmert-Bush call inaccurate". Yahoo News. 13 January 2009. Archived from the original on 14 April 2010. Retrieved 14 March 2014. ^ "Excerpts of Olmert's speech pledging to resign". Reuters. 30 June 2008. Archived from the original on 25 June 2013. Retrieved 18 July 2012. ^ a b "Full text of speech / 'I regret my mistakes'". Haaretz. 31 July 2008. Archived from the original on 14 April 2010. Retrieved 23 October 2012. ^ Ravid, Barak (31 July 2008). "Olmert to step down in September, vows to push for peace first". Archived from the original on 5 August 2008. ^ a b "Kadima officials fear new leader won't be able to form gov't". Haaretz. 31 July 2008. Archived from the original on 19 September 2010. Retrieved 18 July 2012. ^ Tran, Mark (31 July 2008). "Netanyahu calls for new Israeli elections". The Guardian. Archived from the original on 19 September 2010. Retrieved 18 July 2012. ^ "One of Israel's best prime ministers, but corrupt". Haaretz.com. 1 April 2014. Retrieved 1 December 2014. ^ "Israel comptroller checks Olmert's house purchase". Daily Times. 7 March 2006. Archived from the original on 19 September 2010. Retrieved 16 December 2007. ^ a b c d e f g "Ehud Olmert: Corruption allegations". BBC News. 5 January 2012. Archived from the original on 19 September 2010. ^ Jeffrey Heller (24 September 2007). "Israeli police to investigate Olmert house purchase". Reuters. Archived from the original on 19 September 2010. Retrieved 16 December 2007. ^ Zino, Aviram (30 October 2006). "Police to look for criminal aspect in Leumi affair". Ynetnews. Archived from the original on 19 September 2010. Retrieved 18 July 2012. ^ "Zelekha: I'll step down in December". The Jerusalem Post. 10 November 2007. Archived from the original on 19 September 2010. Retrieved 16 December 2007. ^ Kershner, Isabel (10 October 2007). "Olmert Questioned in Corruption Case". The New York Times. Archived from the original on 19 September 2010. ^ Glickman, Aviad (4 December 2008). "State prosecutor closes Leumi case against Olmert". Ynetnews. Archived from the original on 19 September 2010. Retrieved 14 February 2012. ^ "Olmert answers corruption accusations". New Age International. 26 July 2007. Archived from the original on 2 December 2007. Retrieved 16 December 2007. ^ Weitz, Gidi (14 February 2011). "Olmert denies failing to repay 'scandalous' 18-year-loan". Haaretz. Archived from the original on 17 February 2011. Retrieved 14 February 2012. ^ Ethan Bronner (5 May 2008). "Israeli Political Crisis Overshadows Rice's Trip". The New York Times. Archived from the original on 19 September 2010. ^ Sheehy, Kate (6 May 2008). "Israel Scandal's LI [Long Island] Link". New York Post. Archived from the original on 29 April 2010. Retrieved 18 July 2012. ^ "Olmert refuses to step down amid corruption scandal". InTheNews. 9 May 2008. Archived from the original on 19 September 2010. Retrieved 18 July 2012. ^ "Olmert: I'll resign if indicted". Globes. 9 May 2008. Archived from the original on 17 May 2011. Retrieved 18 July 2012. ^ Weiss, Efrat (2 May 2008). "National Fraud Unit investigates Olmert". Ynetnews. Retrieved 14 February 2012. ^ Rabinovitch, Ari (7 September 2008). "Israeli police seek criminal charges against Olmert". Reuters. Archived from the original on 19 September 2010. Retrieved 18 July 2012. ^ כתב אישום בפרשת ראשונטורס [Rishon Tours Case Charges] (in Hebrew). News1. 26 November 2008. Archived from the original on 19 September 2010. Retrieved 17 July 2012. ^ Soltis, Andy (12 July 2008). "Olmert's '100G Fraud'". New York Post. Archived from the original on 30 January 2013. Retrieved 18 July 2012. ^ "An indictment against Olmert in Talanski's affair". MSN. 2 March 2009. Archived from the original on 3 March 2009. ^ Senyor, Eli (15 April 2010). "Olmert cited as 'senior official' in Holyland affair". Ynetnews. Archived from the original on 18 April 2010. Retrieved 14 February 2012. ^ "Indictment served against former PM Olmert in 3 cases". The Jerusalem Post. 30 August 2009. Archived from the original on 19 September 2010. Retrieved 18 July 2012. ^ McCarthy, Rory (25 September 2009). "Ehud Olmert defiant as corruption trial begins". The Guardian. London. Archived from the original on 19 September 2010. ^ Glickman, Aviad (31 March 2011). "Prosecution completes part in Olmert trial". Ynetnews. Archived from the original on 19 September 2010. Retrieved 14 February 2012. ^ Glickman, Aviad (30 June 2011). "Olmert trial: Prosecution starts cross". Ynetnews. Archived from the original on 19 September 2010. Retrieved 14 February 2012. ^ Paraszczuk, Joanna (5 January 2012). "Olmert charged for graft in Holyland Affair". The Jerusalem Post. Archived from the original on 19 September 2010. Retrieved 14 February 2012. ^ Glickman, Aviad (5 January 2012). "Olmert to be indicted in Holyland affair". Ynetnews. Archived from the original on 19 September 2010. Retrieved 14 February 2012. ^ "Zaken: I can land Olmert in prison over Holyland affair". Israelhayom.com. Retrieved 1 December 2014. ^ a b "After reaching deal with Olmert aide, State Prosecution asks to postpone verdict". Haaretz.com. 27 March 2014. Retrieved 1 December 2014. ^ Hasson, Nir; Natasha Mozgovaya (10 July 2012). "Ex-PM Olmert acquitted on two charges of corruption, found guilty of one". Haaretz. Archived from the original on 10 July 2012. Retrieved 18 July 2012. ^ Magnezi, Aviel (10 July 2012). "Olmert exonerated of corruption charges". Ynetnews. Archived from the original on 13 July 2012. Retrieved 17 July 2012. ^ a b c Leshem, Elie (31 March 2014). "Former PM Ehud Olmert convicted of taking bribes". The Times of Israel. Retrieved 13 May 2014. ^ "found guilty". Haaretz.com. 31 March 2014. Retrieved 1 December 2014. ^ "BBC News - Israel's ex-PM Ehud Olmert convicted of bribery". BBC News. Retrieved 1 December 2014. ^ "Report: Zaken agrees to plea bargain, 11 months in jail". The Jerusalem Post - JPost.com. Retrieved 1 December 2014. ^ "Will Ehud Olmert be sentenced to a long prison term for his bribery conviction?". The Jerusalem Post. Retrieved 1 December 2014. ^ "Olmert maintains innocence, refuses to admit guilt in exchange for lighter sentence". The Jerusalem Post - JPost.com. Retrieved 1 December 2014. ^ "Israel ex-PM Ehud Olmert jailed for six years for bribery". BBC News. 13 May 2014. Retrieved 13 May 2014. ^ "Olmert could face new evidence during Talansky and Rishon Tours appeal". Haaretz.com. 27 April 2014. Retrieved 1 December 2014. ^ "Ehud Olmert's attorneys to be quizzed in new obstruction-of-justice probe". Haaretz.com. 6 April 2014. Retrieved 1 December 2014. ^ "Armed with new evidence, state to reopen Olmert probes". The Times of Israel. Retrieved 1 December 2014. ^ "Police urge prosecution of Olmert on obstruction of justice". ynet. Retrieved 1 December 2014. ^ "Retrial ordered in Olmert-Talansky case". The Times of Israel. Retrieved 1 December 2014. ^ "Supreme Court rules Olmert can stay out of jail until Holyland appeal is heard". The Jerusalem Post. Retrieved 21 March 2015. ^ "Holyland II: Where are Judge Rosen's Verdict and Sentence records re: former PM Olmert's corruption?". LiveLeak.com. Retrieved 21 March 2015. ^ "Ehud Olmert, Ex-Prime Minister of Israel, Begins Prison Sentence". New York Times. 15 February 2016. ^ "Olmert offered aide $10,000 a month to serve jail time". The Times of Israel. Retrieved 21 March 2015. ^ Estrin, Daniel. "Former Israeli Premier Olmert convicted in corruption Case". Associated Press. Archived from the original on 2 April 2015. Retrieved 5 July 2015. ^ "Former Israeli prime minister Ehud Olmert found guilty of taking bribes". Washington Post. 31 March 2015. ^ "Olmert jail sentence elicits bout of schadenfreude from pro-settler group". The Jerusalem Post. 25 May 2015. Retrieved 28 May 2015. ^ "Ex-Israeli Premier Olmert sentenced to 8 months in prison". The Seattle Times. 25 May 2015. Retrieved 28 May 2015. ^ "Ehud Olmert Appeals Conviction and 8-Month Sentence in Talansky Affair". Forward. Jewish Telegraphic Agency. 2 July 2015. Retrieved 12 July 2015. ^ "High Court Rules That Olmert Does Not Need To Begin Prison Sentence On Thursday". Yeshiva World News. 8 July 2015. Retrieved 12 July 2015. ^ Shabi, Rachel (5 May 2006). "The unlikely first lady". The Guardian. London. Archived from the original on 19 September 2010. Retrieved 12 May 2007. ^ "Former Prime Minister Ehud Olmert". 4 May 2009. Archived from the original on 19 September 2010. Retrieved 17 July 2012. ^ Cohen, Avi (10 June 2006). "PM's daughter protests Gaza killings". Archived from the original on 19 September 2010. Retrieved 31 July 2008. ^ Fangchao, Li (26 June 2004). "Israel deputy PM visits grandpa's Harbin grave". China Daily. Archived from the original on 19 September 2010. Retrieved 18 July 2012. ^ Shao Da (14 September 2004). "Finding Family Roots at Harbin's Jewish Cemetery". China Through A Lens. Archived from the original on 19 September 2010. Retrieved 18 July 2012. ^ Sofer, Ronny (29 October 2007). "Olmert diagnosed with signs of prostate cancer". Ynetnews. Archived from the original on 19 September 2010. Retrieved 28 September 2008. ^ Sofer, Roni (19 April 2009). "Olmert's cancerous condition deteriorating". Ynetnews. Archived from the original on 19 September 2010. Retrieved 14 February 2012. ^ Martin, Marie (21 October 2009). "Protest Erupts Before Speech". Texarkana Gazette. Archived from the original on 19 September 2010. Retrieved 5 July 2010. ^ Martin, Marie (21 October 2009). "Former Israeli PM speaks on Farms Technology and Iran". Texarkana Gazette. Archived from the original on 19 September 2010. Retrieved 5 July 2010. ^ "Olmert opposes strike on Iranian nuclear program". The Times of Israel. Associated Press. 25 April 2012. Archived from the original on 1 May 2012. Retrieved 30 April 2012. Wikimedia Commons has media related to Ehud Olmert. "Former Prime Minister Ehud Olmert". Ynetnews. 4 May 2009. Archived from the original on 19 September 2010. Retrieved 18 July 2012. Olmert, Ehud (5 June 2007). "1967: Israel cannot make peace alone". The Guardian. Retrieved 18 July 2012. Olmert, Ehud (17 July 2009). "Stop Focusing on the Settlements to Achieve Peace in the Middle East". The Washington Post. Retrieved 18 July 2012.